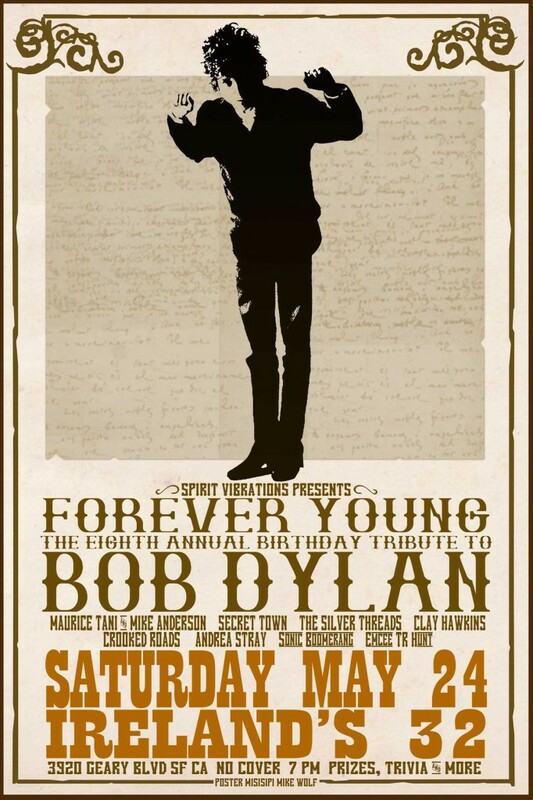 Where Will You Celebrate Bob Dylan's Birthday? Bob Dylan turns 73 over Memorial Day weekend, on May 24. 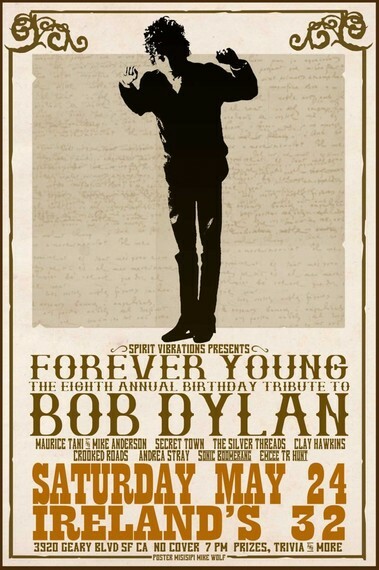 Increasingly, birthday celebrations are being held around the world by his fans, featuring local musicians playing covers of Dylan songs and tributes of their own. This year, America is taking advantage of the fact that his birthday falls on the Saturday night of a holiday weekend. 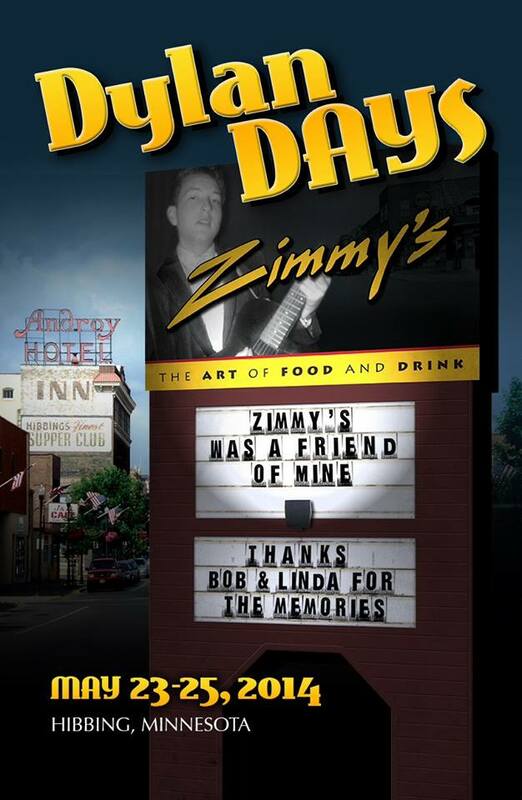 Dylan's birthplace in Minnesota already held a party for him on May 17 at the Duluth Armory. 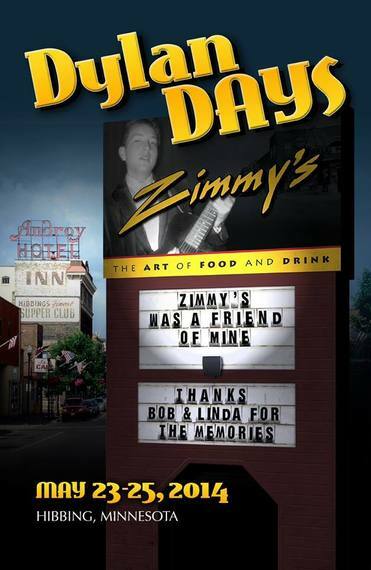 This weekend, though, the king of all the Bobfests, Dylan Days, happens in his boyhood hometown of Hibbing, MN. Along with concerts and bus tours of Dylan sites, a writing prize named for B. J. Rolfzen, Dylan's high-school English teacher, will be awarded; David Kinney reads from his new book The Dylanologists; and a traveling show of Daniel Kramer's iconic photographs of Dylan is in town. Both coasts are partying this weekend, with "Forever Young" in San Francisco on Friday night at Ireland's 32. To the north, in redwood coast country, there's a Birthday Bash at the Mad River Brewery in Blue Lake. 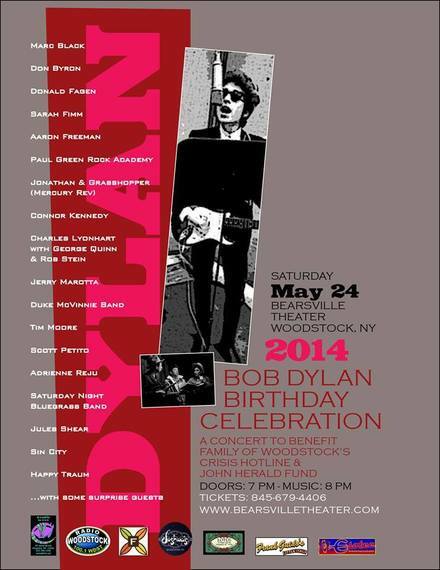 The Hudson Valley is the best place to be, if you can't be in Hibbing, to celebrate Dylan's birthday. The Complete Unknowns and Hollis Brown -- who both take their names from Dylan's songs -- and the Kennedys are at the Warwick Valley Winery in Warwick, NY, for "A Tribute to Bob Dylan," just across the Thruway from Bear Mountain. In Dylan's former home, Woodstock, what promises to be the best music always happens. For years, now, Happy Traum has curated -- and delightedly led -- a birthday party for his old friend in town. The venues have grown larger and larger, and the event is always a tribute for a good cause; this year, at the Bearsville Theater, for the John Herald Fund and Family of Woodstock, supporting those in need in the area for more than 40 years. Joining Traum for an evening of Dylan's songs are Don Byron, Donald Fagen, and a host of the town's excellent musicians. A bonus if you arrive early in Woodstock: see performance artist Linda Mary Montano lip-syncing Dylan's songs all afternoon, in costume, and in a 14-foot-lift, just off the town green. Can't make it to any of the events and concerts? Don't despair. On Saturday, listen to some songs, and sing along -- you know you know all the words. And look forward to Dylan's new album, scheduled, so they say, to appear some time late this summer. Here's the only track released so far: "Full Moon and Empty Arms."